Sharon Renold is a young and gifted bassist, singer and songwriter from Switzerland. 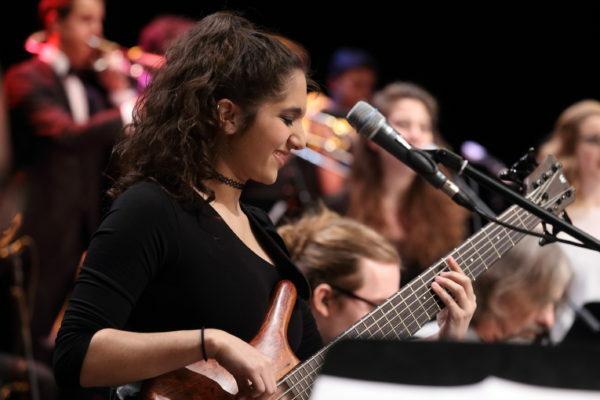 She grew up surrounded by music and musicians at Jazzaar, influencing her day in and day out. Sharon picked up the Bass at the age of four and a half mainly in the styles of jazz and pop but has since become a highly versatile bassist, competent in jazz, pop, world, soul, indie, rock and more! Just a couple of years later she received vocal training from her mother, Helen (Berklee 88’) and it wasn’t long before she sang accompanying with the bass. Some of Sharon’s greatest influences include: Esperanza Spalding, Oli Rockberger, Reggie Hamilton, Kai Eckhardt, Knower, HAGO and Tigran Hamasyan. Having just released her debut single ‘Open Letter’ in January 2019, Sharon is currently working on publishing her first two albums. A duo setting with Tom Bar (HAGO, Bar Morach) focusing on electric Jazz and her first of original music – both of which are set to release in the very near future. Check her out!